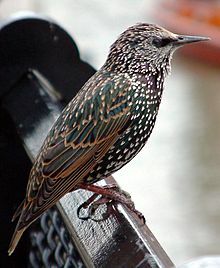 From Middle English starling, sterling, sterlinge, from Old English starlinc, stærlinc (“starling”), from stær (“starling”) + -linc, -ling (diminutive suffix). Cognate with Middle Dutch sterlinck (“starling”). A California fish, the rock trout, Hexagrammos, especially, Hexagrammos decagrammus, the boregat or bodieron. Albanian: shturë (sq) ?, gargull (sq) ? Sardinian: istùrulu campinu ?, sturru grandinau ? Italian: palificazione (it) f, palafitta (it) ?